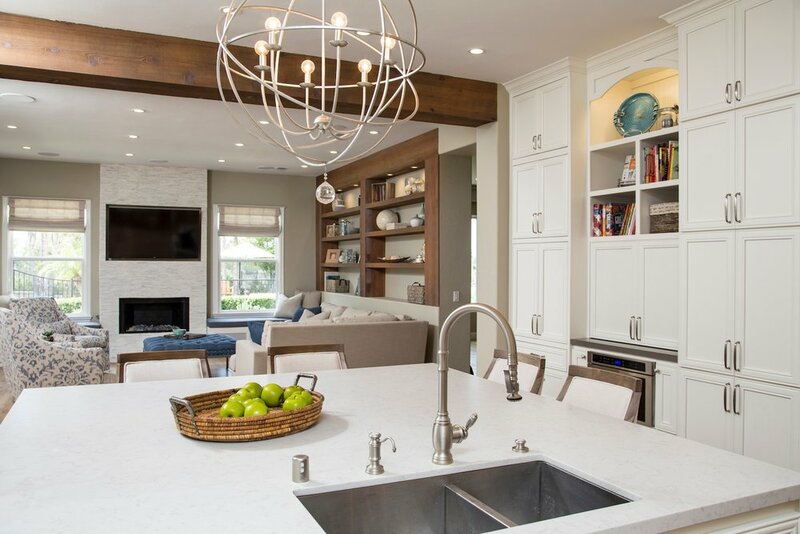 This client dreamed of a light-filled, beachy retreat with a kitchen, family room and powder room that represented their relaxed in-door/outdoor lifestyle in a unified entertaining space. The clean, open feel of the newly renovated rooms are highlighted with classic white cabinetry that extends up to the ten foot ceilings. To add to the overall beach style, we added a hand-scraped, natural oak wood floor, Malibu that extends through the entire first floor of the home. Rustic, dark architectural beams were added over-head in between the kitchen and family room for a slight delineation of space, but also flow nicely between the two spaces. Design details like the chandelier above the table/island in the kitchen and the fixtures in the family room and powder room add a sense of sophistication and whimsy to the home. The overall result for this project is a fresh take on the relaxed beach style and gives this young family all of the functionality that they need for many years to come.